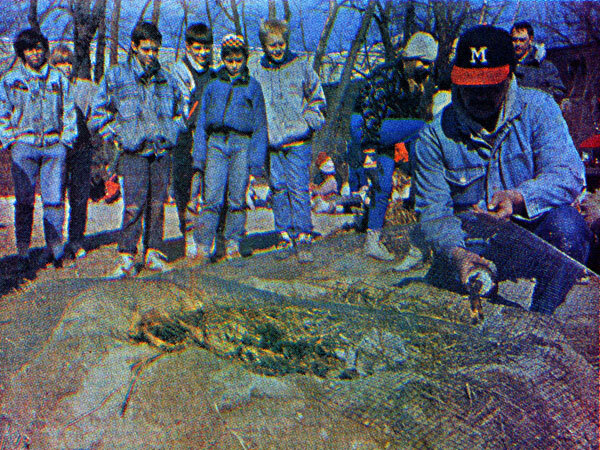 In 1990, my first experience with the pit firing process was done through a Wisconsin Arts Board Grant and a group of elementary students. The grant was part of the state's artist-in-education program. One hundred and thirty third graders, their teachers, and I set up a play scenario at Olympia Brown Elementary School in Racine, Wisconsin. We opened the O. Brown Pottery, immersing these students in the craft of the potter using play acting as a method of acquiring knowledge. These students knew as much about the pit firing process as I did when we started. We were equals. To establish the O. Brown Pottery, the students utilized a number of play scenarios. We opened a small business (the O. Brown Pottery). The students then borrowed $1,000.00 to buy clay, using the principal’s car as collateral. Each student learned how to construct and fire pots. The five separate third grade classrooms designed and built their own pit for firing pots on the playground outside the school. The classrooms experimented and discovered the effects of pit design, types of fuel used, and the amount of oxygen or lack of oxygen and its effect on the pots fired. The students designed a brochure and planned an art exhibit to sell their finished pottery and pay off the loan. Each student participant donated the sales of one pot, as their payment toward the loan. The money from sales sold after their donation went in their pocket. Classroom instruction used this theme immersion to teach math, science, language, and critical thinking skills, as well as an understanding of other cultures and their pottery. Through this method of play, and the fantasy that we were all artists trying to meet a deadline so the principal wouldn't lose his car if we defaulted on our loan, we learned many new skills. We learned how to make and fire pots in a pit, how to start a business, and how the process of play can lead to self-discovery. The best part was—we had fun. As a potter, I gained a knowledge of the pit firing process in collaboration with O. Brown students and staff. This story demonstrates a healthy and playful attitude toward a change in the creative direction of my work. Years later, I continue to learn through this process of discovery.